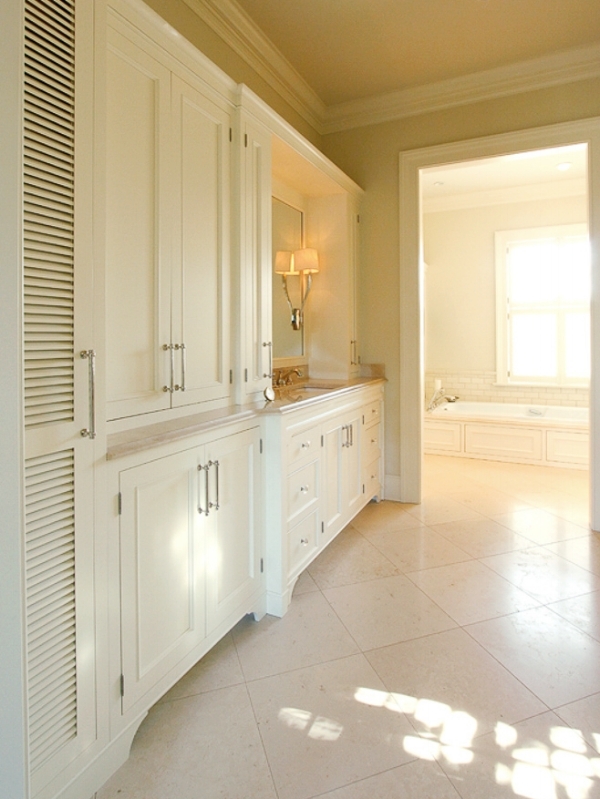 An elegant "His and Hers" master bath suite featuring furniture style details throughout. The louvered door finishes the face of a tall linen cabinet. Panels surrounding the bathtub remove for access to plumbing. Solid walnut framing and veneered faces contrast the maple panels in this modern master bath. With Wilmes and Associates Architects. This double sink vanity, built for a second floor guest bath, was approached as a furniture piece. The solid walnut construction relies on traditional joinery for the free standing structure. Two wide fronts tilt open for access to storage trays. Referred to as "The Three Boxes" throughout its production, this guest bath storage cabinet is as minimal as it gets. Via touch-latch hardware the veneered faces reveal a drawer at top with two doors below. A collaborative project with Wilmes and Associates Architects. With a wood top, light distressing and a glaze finish this mahogany vanity feels more like a repurposed antique dresser.